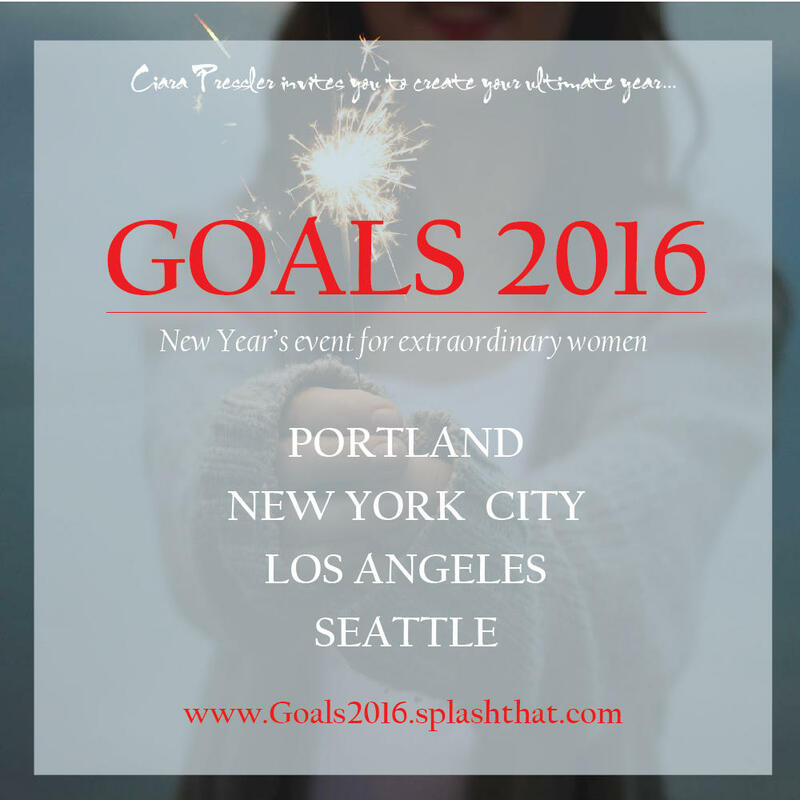 This year marks our 5th Annual New Year's Goal Event in New York City, and I'm celebrating by adding the first-ever women's goal brunches in Portland and Los Angeles! Join me in your city and spread the word to your ladies on both coasts who are all about becoming their best. This year's theme is Own Your Success: shunning "shoulds" to define your own standards for life, relationships, health, wealth, work, and happiness. Own your accomplishments. Own your goals. Own your results. You'll walk away with a written framework for measuring success according to your personal standards, support for your 2016 goals, and an extraordinary new network to help you get where you want to go this year. Your ticket includes the print edition of my Game Plan goal setting workbook, gourmet food & drinks, and a special surprise to empower your year. Best of all, you'll become part of our network of passionate, smart, amazing women who are committed to pursuing their own personal and professional goals. You're encouraged to invite like-minded women - this is a great opportunity to show your circle that you believe in their vision for success. Bringing the magic & motivation to PDX: Spread the word and RSVP Now! It's our 5th Annual event - let's make it the best one yet! Many of our original goal ladies are now in SoCal - it's time to bring the best brunch to the West Coast! You asked, we delivered: let's launch in style! Ciara is on a mission to help you discover your true goals and create a plan to make those goals a reality. She is the author of Game Plan and founder of Pressler Collaborative. After a 25-year corporate career as a business strategist and executive for Nike, Saks Fifth Avenue, and May Company, Cindy Tortorici invented The Link For Women as a resource for women to create their vision and leverage their community to reach their goals. You'll receive a complimentary print edition of the Game Plan Goal Workbook at your event! Is this Going To Be An Awkward Touchy-Feely Thing or Intense Business-Type Thing? Neither. It's more like a chill birthday party with really cool new friends, except you're the birthday girl AND the best friend. My goal is to create an environment where everyone feels welcome and leaves enlightened and inspired. Can I Invite People? What if I Don't know Anyone? Yes, please do! This event has gotten bigger and better each year because people keep coming back and inviting equally awesome women. Most people won't know most other people, so no one is the odd-woman-out. And the whole point is to get out of your normal circle to get fresh ideas & support for your goals. Let's be honest, we act differently when there are men in the room. Goal Brunch is a safe space to explore our aspirations around relationships, physical health, the workplace, and motherhood, and it's easier to get real in the company of women who can identify with our challenges. Do I have to Buy a Ticket in Advance? Yes please. Advance tickets make sure I know numbers ahead of time since space is limited and everything is purchased in advance. For that reason, there are no refunds. I make zero profit on this event. It's all for the love of starting the year off right. I have your answer - email me at ciara@presslercollaborative.com.